Well, actually I’ve had postcard block for ages. I need to send of the image for a new postcard for Origin NOW. I’ve had several weeks to work this out and have been going round and round in circles with it. What I really needed was a session with a professional photographer and some lovely new pics. But I didn’t do that. Instead I just stressed about it. I thought it might help to put some options up here. But blogger doesn’t like photos today, so that is the end of that plan. Ho hum. I’m actually veering towards just using the same image as one of my existing postcards. After all, it’s very popular and I haven’t got that many hundreds left, and I’d only have to reprint eventually. Stick with what works, right? Or maybe a larger version of this which I used for my business cards and they are running out now. I think it might make a nice postcard. This is one I wanted to use, but I don’t think it’s good enough. Or this maybe, but a bit boring. I’m going to sleep on it, and maybe the decision will be easy in the morning. Edit: decision made. It’s this one. 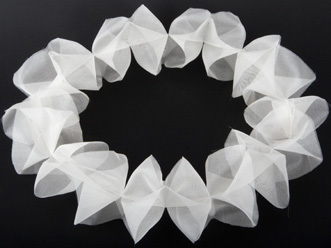 Organza neckpiece – the reprint. I love the organza neckpiece photo! I was going to vote for that one or the Garrick cushion, both lovely!